Volkswagen AG's Audi luxury unit may add a new factory in China as a plant in Changchun won't suffice to back the carmaker's expansion in the world's largest auto market. 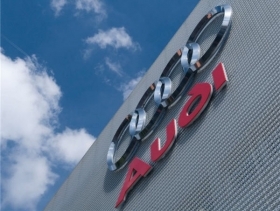 Audi has a goal of delivering 1 million cars and SUVs in China, where it outsells rivals such as BMW AG and Daimler AG's Mercedes-Benz, in the next three years alone, spokeswoman Andrea Seltmann said by phone. Audi aims to boost Chinese sales by more than a quarter to more than 200,000 units this year. “It's clear that over the long term, our capacities in China won't suffice,” Seltmann said, referring to Changchun where Audi only last year raised production capacity to 300,000 units. There's no decision yet on the new factory, she added. When asked last week by Reuters whether Audi would add a new plant in China, Audi CEO Rupert Stadler said: "Maybe for the future. Yes." He added: "First of all, we are able to do that within the existing capacities, to ramp with the paint shops and with assembly lines. But in the long run we will need additional capacity, maybe also outside Changchun." Audi, whose nine-month Chinese sales surged 61 percent to 174,907, is targeting worldwide record sales of more than 1.08 million units this year, a rise of 14 percent from 2009. The carmaker aims to introduce a dozen models in 2010, including the A1, Audi's smallest vehicle, and a coupe dubbed the A7, as it increases the lineup to 42 vehicles by 2015 from 34 last year. Audi currently produces extended versions of the A4 and A6 models and the Q5 SUV in Changchun, which is operated by VW and its Chinese partner FAW Volkswagen Automotive Company Ltd. Audi aims to increase the number of Chinese dealers to more than 400 by 2013 from 157, Seltmann said. Global luxury car makers have racked up eye-popping sales in China. Mercedes-Benz more than doubled its China sales to 101,350 units during the period, while BMW sold 121,826 vehicles. Audi has now sold a total of more than 1 million cars in China, where its first locally made model, an Audi 100, rolled off the production line in the northeastern city of Changchun in 1989.